I was exhausted Saturday, and after getting breakfast at 9:15 I went back to bed. I got back up around 1:00 and started getting ready for the game. 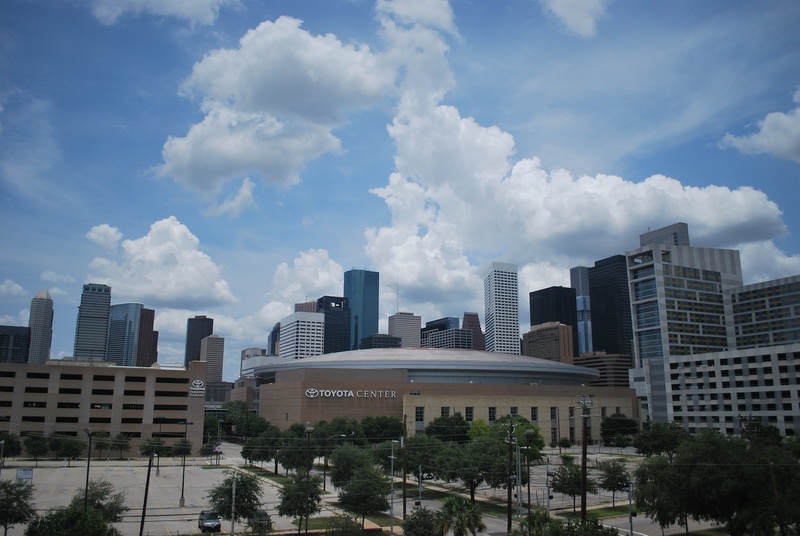 I hadn’t even bothered to look outside on Friday and on Saturday I realized I had a nice view of downtown Houston. When I was here in May my room was on the other side of the hotel and the view was nothing like this. I left at 2:10 and was inside Minute Maid Park 15 minutes later. 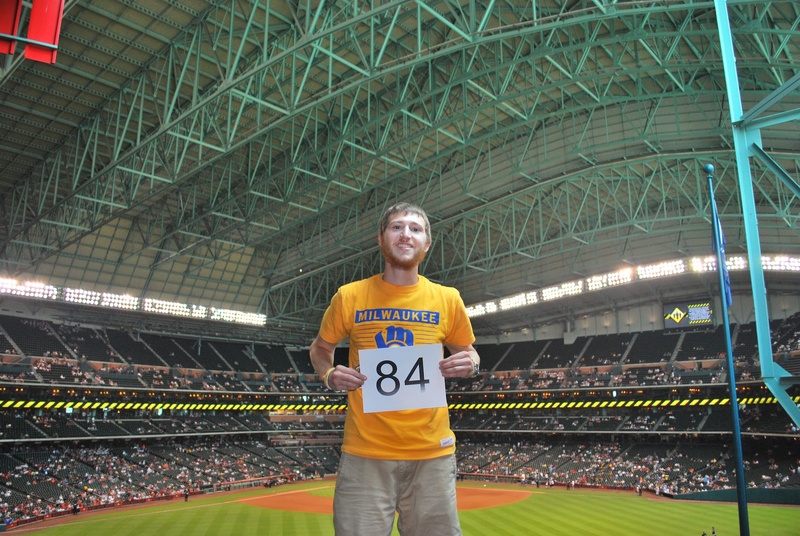 I headed right for section 258 in straightaway centerfield and used the ten second self timer to get game photo number 84. It took a few tries but I made it work. I know you can’t see much of the field, but being able to see the roof is cool because that’s one of the main features of the stadium. I just can’t seem to hold the number sign straight. After taking the picture I went down to the field level and got a BBQ brisket sandwich from the Maverick Smokehouse stand. 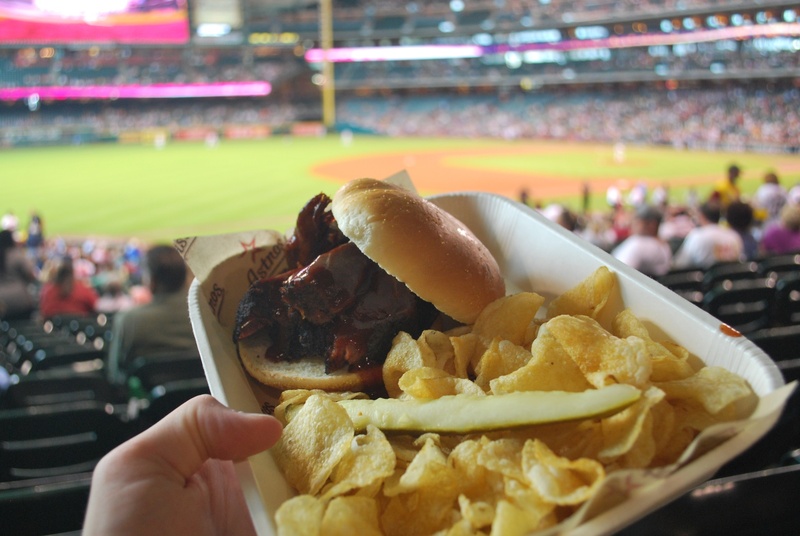 It was $11 for the brisket sandwich, chips, and a pickle. A little steep, but after eating it I’d say it was worth it. 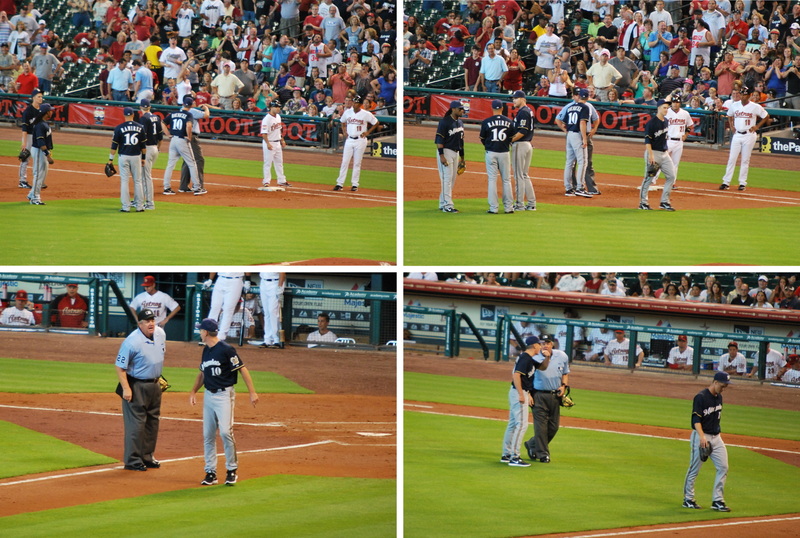 1) Roenicke giving Holbrook an earful, just after Holbrook had ejected him. 2) Roenicke really letting Holbrook have it, as Greinke walks towards the dugout in disbelief. 3) Roenicke talking to/yelling at home plate umpire Joe West. 4) Roenicke getting his last words in as Joe West responds in kind. Four pitches; that’s all Greinke threw on Saturday, unbelievable. It’s one thing for an umpire to eject a guy for directing an F-bomb at them, but for spiking a ball? Batters spike their helmets, break their bats, and throw their protective gear after striking out on a bad pitch and they don’t get tossed. I’m guessing Holbrook thought Greinke was showing disgust in the call, but when he didn’t say anything to him how can he make that assumption? The infield single resulted in the Astros getting a run, and Livan Hernandez came on to finish the inning. I told Annie that maybe Livan could pull an Ernie Shore. I remember from reading Babe Ruth’s autobiography that once when he was a pitcher he got ejected after walking the leadoff batter. Ernie Shore came on in relief and picked the runner off. He then retired the next 26 batters in order, and was apart of the combined no hitter. I really didn’t think Livan had a chance, but I still thought the Ernie Shore story was funny/topical. The Astros got three more in the third, one in the fourth, and one in the fifth to take a six to nothing lead. 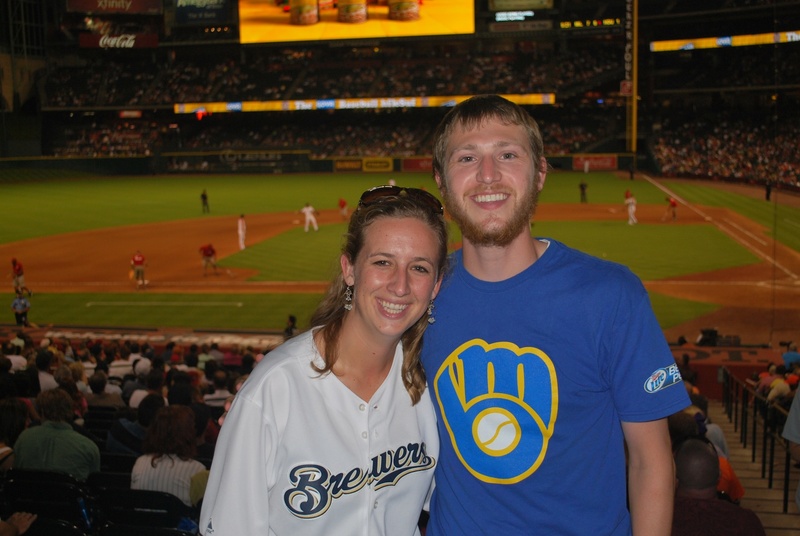 The Brewers scored two in the sixth and one in the eighth, but that’s all they could muster. Final Score: Astros 6 – Brewers 3. The Crew had lots of scoring chances and stranded 10 on base as a team. In the sixth they had runners on second and third with two outs, but Izturis popped out. In the eighth they had first and second with nobody out, but only got the one run, it was that kind of day. 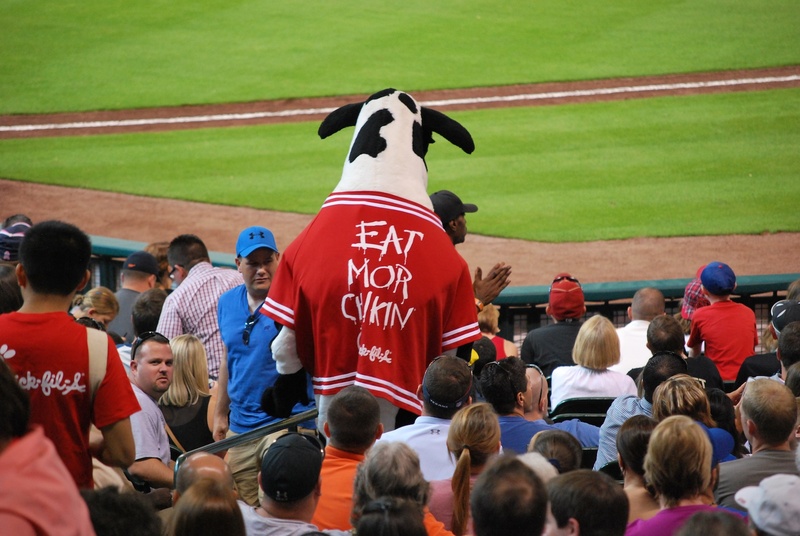 At one point the Chick-Fil-A mascot came down the aisle closest to us and was throwing out t-shirts. We were made aware of the cow’s visit beforehand because a cute little girl a few rows in front of us was facing the concourse, pointing, and saying “cow”. I’m hoping the Crew can end the first half on a high note by taking game three and winning the series. That is all. Distance as % of Earth’s circumference: 95.13% (23,688.7/24,901) Almost there…..